The Bush administration, frustrated by Iranian defiance over its nuclear program, proposed Wednesday to spend $85 million to promote political change inside Iran by subsidizing dissident groups, unions, student fellowships and television and radio broadcasts. Californians virtually eliminated bilingual education from the states schools by passing Proposition 98 eight years ago. 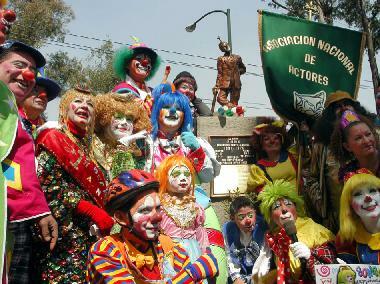 Yet, parents who want their kids educated through bilingual education have been able to do so since the new law included a waiver as an escape hatch..
Mexico City  Tens of clowns attended this past February 17, 2006 the opening of La Plaza del Payaso ( The Clonws Plaza), located in a very important avenue of the capital city. EFE/Germán Romero. 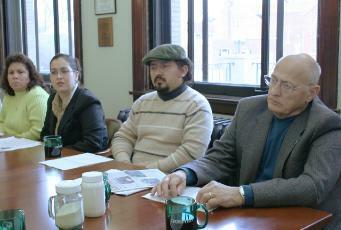 From left, Delia Murillo, Claudia Garcia, Cesar Rodriguez and Senator Marvin Reigsecker at the meeting pro Driving Privilege Card held in Goshen on February 17, 2006 . (photo: Axel Hernández)..